The El Rio Preserve is owned and managed by the Town of Marana. The Preserve is 104 acres, comprised of parcels 226-01-0170, 226-03-0130, and 226-03-0120. It is located adjacent to the Santa Cruz River and is an area of rich riparian habitat for nesting and migratory birds. In fact, over 200 species have been observed within the Preserve. Marana has a series of improvement projects planned for the Preserve. For current information on what Marana has planned and their schedule, please see Marana’s Website at: http://www.maranaaz.gov/elrio. 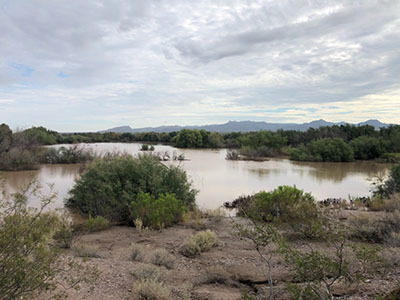 In previous years, the Preserve has been flooded by the Santa Cruz River when the earthen berm protecting the Preserve breached. This comprised some of Marana’s earlier efforts to restore the site, washing in trash and eroding the lakes. 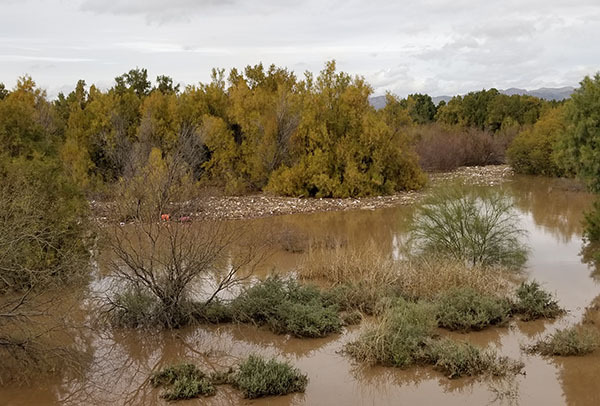 To protect the Preserve from frequent flooding, allowing for restoration and further enhancements, the Pima County Regional Flood Control District (District) has been asked by Marana to design and construct bank protection along the northern side of the Preserve at the Santa Cruz River. This would replace the eroded earthen berm that previously protected the lakes. The intent of the bank protection is to help minimize the damage from frequent flooding. This includes reducing the amount of trash and invasive species that flow in during a storm event. The bank protection will be constructed from soil cement and is being designed to protect the Preserve from receiving flows up to the 25-year event. The El Rio Preserve Bank Protection project construction plans are currently under design. The District anticipates construction will being in December 2019. Information related to Design will be placed here as it becomes available. Information related to Construction will be placed here as it becomes available. Information related to Funding will be placed here as it becomes available. Information related to Public Outreach will be placed here as it becomes available.